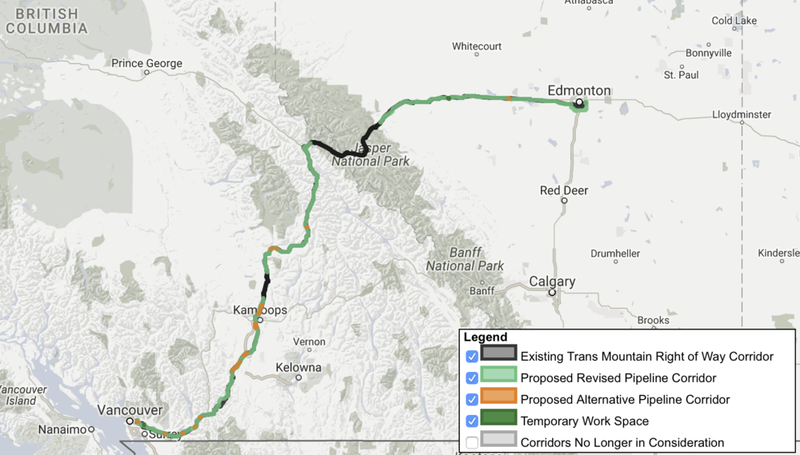 The province of BC has granted an Environmental Assessment Certificate for their portion of Kinder Morgan's Trans Mountain Expansion. BC has added 37 new conditions, on top of the 157 conditions imposed by the National Energy Board (NEB). Some of the province's conditions are quite similar to the NEB's, which include consultation with aboriginal groups, a wildlife mitigation plan and worker accommodations during construction of the pipeline. Although interprovincial pipelines are normally under federal jurisdiction, BC's Supreme Court ruled that a provincial approval was also required as per BC's Environmental Assessment Act. However, the court ruled that the province could rely on the NEB's assessment, avoiding a separate review process. Last month, Premier Christy Clark declared that all five of BC's conditions were met for approving "heavy oil" pipelines through her province. Those five conditions included completion of the NEB environmental review process, a "world-leading" spill response plan, compliance with Aboriginal treaty rights and revenue sharing as well as evidence of economic benefits for the province of BC. Kinder Morgan has also agreed to pay the province up to $50 million annually (depending on pipeline transport volumes), which will be funnelled into the new BC Clean Communities Program. The grant will provide funding for local projects such as land purchase for parks, restoration of natural habitats, beach clean-up and marine conservation. The payouts add up to as much as $1 billion over the next 20 years. Kinder Morgan's Board of Directors has yet to make a Final Investment Decision on the $6.8 billion Trans Mountain Expansion. The company is actively looking for a partner to help fund the project, and has promised its shareholders it will not tap into equity markets anytime this year. If all goes according to plan, construction is expected to begin in September, with an in-service date of late-2019.